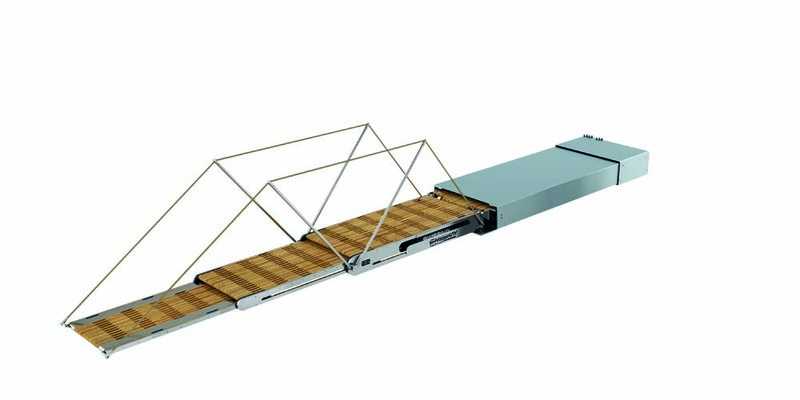 The retractable gangway Mori is the “middle” double telescopic trunk gangway intended for the passage of people during the loading / unloading from the dock. The sliding blocks are made of antifriction material non-hygroscopic (Delrin®). Length available in several sizes. Mechanical actuated hatch on the trunk. 3200 3200 1400 900 900 465 420 375 1950 548 239 150 KG. 3200+300 3500 1700 900 900 465 420 375 2250 548 239 150 KG. 3500 3500 1500 1000 1000 465 420 375 2050 548 239 150 KG. 3500+300 3800 1800 1000 1000 465 420 375 2350 548 239 150 KG. 3800 3800 1600 1100 1100 465 420 375 2150 548 239 150 KG. 3800+300 4100 1900 1100 1100 465 420 375 2450 548 239 150 KG. 4100 4100 1700 1200 1200 465 420 375 2250 548 239 150 KG. 4100+300 4400 2000 1200 1200 465 420 375 2575 548 239 150 KG. 4400 4400 1800 1300 1300 465 420 375 2375 552 243 150 KG. 4400+300 4700 2100 1300 1300 465 420 375 2675 552 243 150 KG. 4600 4610 1870 1370 1370 465 420 375 2475 552 243 150 KG. 4600+300 4910 2170 1370 1370 465 420 375 2775 552 243 150 KG.